If you are to believe the TV advertising for the likes of Calgon you would be drawn to the conclusion that limescale is a terrible thing that will destroy the insides of your washing machine. The commonly shown elements completely furred up with lime deposits or, in one case a drum coated in limescale is, at best, extremely rare. It's not the huge issue for reliability that it is made out to be in these adverts but scaring people into buying these products does seem to be the order of the day. That is not to say that there isn't a need to clean your machine regularly as, quite simply, there is. The reasons for doing so just aren't about limescale in particular and, where limescale is a problem the most, these products won't help in a lot of cases but a little advice will. 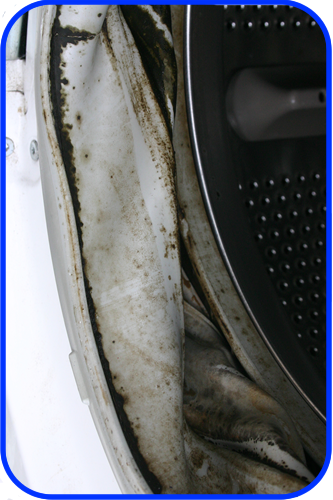 The soap drawer in your washing machine is more prone to limescale issues than anything else in most machines. Not so much the drawer that you place detergent and conditioner is, but the jets that allow the water in above that are prone to blockage from limescale and general bacteria build up. For completeness however we will describe the complete process. Every single washing machine can have the soap drawer cleaned, they are designed in such as way as they can be removed reasonably easily for just this purpose. Thankfully designs are relatively similar and have changed little in the past thirty years so generic advice will suit almost all washing machines on the market. The actual soap drawer, this is the drawer that pulls out you put detergent and conditioner in, will almost always have a release tab that is pushed down and the drawer pulled forward to remove it from the machine. The other method is a simple sharp tug to release the soap drawer where there is no release tab. Once out, take the syphon found at the back of the conditioned compartment off and clean the whole drawer very thoroughly with a stiff brush in warm water. A brush for washing dishes with is ideal for this process and the next step. DO NOT PLACE THE SOAP DRAWER IN A DISHWASHER! If you do the high temperature in a dishwasher can warp the plastic leading the drawer no longer fitting and, soap residues can cause issues in your dishwasher. The soap dispenser compartment also requires cleaned. A good bleach diluted in some warm water is ideal for this part of the process along with the brush mentioned previously. Thoroughly clean the compartment with the brush, paying particular attention to the corners as this is where bacteria will lurk. Where limescale is an issue is on the dispenser jets that you will see by looking at the top of the empty compartment. These jets are commonly blocked by limescale and bacteria deposits and, if not regularly cleaned, the assembly may have to be replaced in the worst instances which we will be happy to help with. They are easily maintained however. With your brush give the jets a good clean and try to get the bristles of the brush into the small holes (the jets) to ensure that they are clear of any blockage. It is that simple! After cleaning the soap drawer can be reinserted. Some washing machines have a small "bell" on the pressure chamber leading to the pressure switch hose. This "bell" can become blocked with limescale and cause problems. This is, apart from a bit of limescale on the element, usually about the worst we see in terms of limescale build up. You do lots of low temperature washes and, especially so if you only (or mostly) use liquid detergent or a detergent for colour only. Neither contain bleach and low temperature washes are not sufficient to activate a lot of components within the detergents, of any type, to combat limescale. In any boxed powder there are elements known as "builders" that will capture and remove limescale. Dosed correctly there should be no need for any limescale removal products at all. However, as we have repeated on this site many, many times there is a call for cleaning the insides of your machine through regular maintenance washes, once a month is the ideal frequency. You can do this with a regular powder which contains bleach, such as Ariel or Persil biological "powder" NOT a liquid, as liquid detergent is totally unsuitable for this task. However, whilst this is better than nothing, there are a number of products available that will do a much better job of cleaning the insides of your washing machine and remove both limescale and bacteria build up. Whilst these may not be essential if you do everything correctly, most people don't and so the use of a cleaner is recommended. All these products require the machine to be run, empty bar the product dosage as directed, on at least a 60˚C (preferably 90 degrees celcius) cotton wash to clean out the inside of your washing machine. All also ideally need to be used once a month or, once every two months to get any long term benefits from their use. But then, that fits with the schedule recommended by almost everyone in the industry for maintenance washes anyway. Sort washing into whites and dark colours For best possible results you really do need to sort your washing into ‘whites’ and ‘dark colours’. Use a bleach and a ‘colour’ product To get the best possible results you should always use a detergent powder containing bleach for ‘whites and light’ colours, and a ‘colour’ detergent which does not contain bleach for darker colours. Don’t overload your washing machine Do not overload the washing machine, always leave a 10cm gap – (just less than a hand span) between the top of the drum and the laundry. Otherwise, the clothes soak up so much water there’s not enough left to dissolve the detergent. The laundry will not clean properly and the non-dissolved detergent can leave a white residue. Use the correct dosage of detergent Its extremely important to use the detergent recommended by the manufacturer and correct dosage level (especially as we live in a hard water area). It may sound obvious, but the best advice is always to read the dosage instructions. Follow the fabric care labels It is also very important that you look at and understand the fabric care label on your clothing. If care instructions are ignored, clothes can be damaged or simply not cleaned effectively. Perform a monthly ‘service wash’ Smells in a washing machine are usually caused by a build-up of bacteria and other deposits.The best solution is a 90 degrees service wash, with no load and a bleach containing ‘powder’ such as Ariel Biological or Persil Biological. Remember to always leave the door open between washes. This, as shown in an extreme example in the photograph to the right, is caused by a bacteriological build-up in your machine due to poor cleaning. It really is that simple and, all too often, it is caused by incorrect detergent use. What happens is that under-dosing or using the incorrect detergent for too long without performing a maintenance wash will allow bacteria to build up in the washing machine which will grow very happily in the warm damp conditions which will eventually lead to what is shown here on the door seal or door rubber as some people call it. Also using solely liquid detergents, liquid tablets, colour only powders (or liquid) as well as most of the “alternative” products like Soapnuts, Ecoballs and Ecover do NOT contain any bleach and will not remove any bacteria effectively. Should you wish to use these alternative products you will also have to add bleach to prevent “greying” of your whites over time as well as other problems. 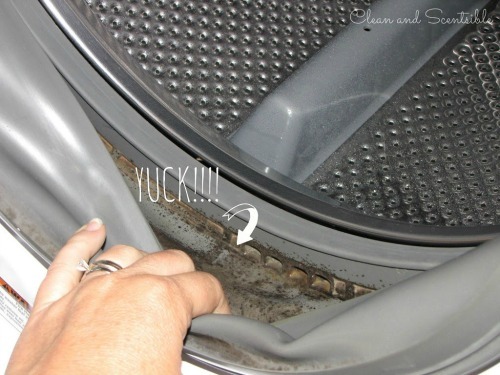 Leaving the machine door slightly ajar when not in use also massively helps as this allows the seal to dry out and hinders the growth of bacteria inside the washing machine’s drum as well as the door seal. As you can see from the photograph the effects are extremely visible and noticeable to the naked eye and, whilst a maintenance wash will help the situations, depending on how bad it is there may well be no alternative but to replace the door seal. Ultimately the only real cure is a replacement door seal on the washing machine and regular maintenance washes thereafter. There have been some reports of other cleaning products working in some instances, but these are sketchy at best for the most part and it is very hard to get into the crevices of the door seal to get it clean. In cases where this does happen, I’m afraid that almost every time it’s too late by the time that you do something about it and there is little alternative bar a replacement door seal and that prevention is better that the cure.